LEXINGTON, Ky. (AP) — PJ Washington scored 23 points, Keldon Johnson added 19 and No. 5 Kentucky upset No. 1 Tennessee 86-69 Saturday night to end the Volunteers‘ 19-game winning streak. The Wildcats used a 25-7 surge over a little more than seven minutes for a 62-38 lead, providing a cushion that withstood the Volunteers’ 13-0 spurt soon after that cut the advantage in half. Kentucky maintained a double-digit lead to win the highly anticipated matchup of top-five schools. Kentucky (21-4, 10-2) also avoided a second consecutive SEC loss to stay within reach of co-leader Tennessee (23-2, 11-1), which hadn’t lost since Nov. 23 to No. 2 Kansas. DURHAM, N.C. (AP) — RJ Barrett had Duke’s first triple-double in 13 years, finishing with 23 points, 11 rebounds and 10 assists in the Blue Devils‘ victory. Markell Johnson had 16 points and 10 assists for the Wolfpack (18-8, 6-7), who had their two-game winning streak snapped. SAN DIEGO (AP) — Rui Hachimura scored 16 of his 22 points in the second half and had 10 rebounds and Gonzaga pulled away in the second half for its 16th straight victory. Zach Norvell Jr. added 18 points, Josh Perkins 15 and Brandon Clarke 14 for the Bulldogs (25-2, 12-0 West Coast). The nation’s highest scoring team, Gonzaga had only 30 points in the first half but then scored 31 points in the first 9:59 of the second half to take control. Olin Carter III scored 20 points for San Diego (16-11, 5-7). CHARLOTTESVILLE, Va. (AP) — Kyle Guy scored 22 points, De’Andre Hunter had 20 with 10 rebounds and Virginia withstood a late push by Notre Dame. Hunter scored six points during a 9-0 run for the Cavaliers (22-2, 10-2 Atlantic Coast Conference) after the Fighting Irish closed to within 45-44 with 8:12 left. T.J. Gibbs scored 17 and D.J. Harvey had 10 for Notre Dame (13-12, 3-9). 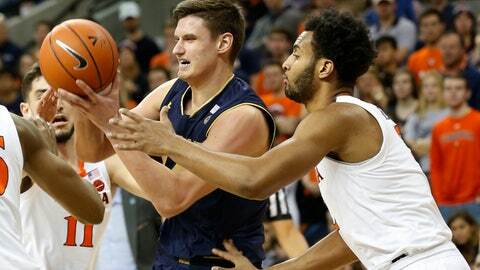 Notre Dame got within 54-52 in the final minute after Virginia went scoreless for more than four minutes. But Guy made four free throws to seal it. ANN ARBOR, Mich. (AP) — Charles Matthews scored 14 points and Iggy Brazdeikis added 13 to lift Michigan over Maryland. The Wolverines (23-3, 12-3 Big Ten) rebounded from their loss at Penn State earlier in the week. Michigan raced out to a 14-2 advantage and led by as much as 15 in the first half. Bruno Fernando scored all 12 of his points in the second half for the Terrapins (19-7, 10-5). LARAMIE, Wyo. (AP) — Trey Porter scored 14 points, Jordan Caroline and Caleb Martin added 13 apiece, and Nevada easily beat Wyoming for its 10th straight win. Nevada avenged its loss last season at Laramie, when Wyoming defeated the then-No. 23 ranked Wolf Pack 104-103 in two overtimes. Justin James led Wyoming (6-19, 2-10) with 16 points, followed by TJ Taylor with 13. WINSTON-SALEM, N.C. (AP) — Cameron Johnson scored 27 points, and North Carolina scored the game’s first 18 points en route to its biggest-ever margin of victory in an Atlantic Coast Conference road game. Freshman Coby White added 10 points, five rebounds and six assists for the Tar Heels (20-5, 10-2), who dominated from the tip following their first loss in a month. WEST LAFAYETTE, Ind. (AP) — Carsen Edwards scored 15 of his 21 points in the second half and Matt Haarms added a career-high 18 for Purdue. The Boilermakers (18-7, 11-3 Big Ten) reclaimed a share of the conference lead with their ninth win in 10 games. Lamar Stevens finished with 18 points and Rasir Bolton had 17 for Penn State (9-16, 2-12). The Nittany Lions have lost have 10 of 12. LAWRENCE, Kan. (AP) — Devon Dotson and K.J. Lawson each scored 15 points, and Kansas beat depleted West Virginia. Dedric Lawson, K.J.’s brother, had 14 points for the Jayhawks (20-6, 9-4 Big 12), who won their third straight as they continue to start four freshmen. LUBBOCK, Texas (AP) — Jarrett Culver scored 18 points and Davide Moretti added 17 as Texas Tech cruised past short-handed and turnover-prone Baylor. Jared Butler scored 16 points and Mario Kegler added 15 for the Bears (16-9, 7-5 Big 12), who were without key backcourt players Makai Mason (foot) and King McClure (knee) for the third consecutive game. Texas Tech (21-6, 9-4 Big 12) stayed in second place in the conference by using an uncharacteristic hot hand from 3-point range to surge into a first-half lead that was never threatened. LOUISVILLE, Ky. (AP) — Christen Cunningham scored 16 of his 18 points in the second half to rally Louisville, which hung on in the final seconds. The Cardinals (18-8, 9-4 Atlantic Coast Conference) led 56-49 with 17 seconds left after a free throw by Steven Enoch but then nearly lost a third straight in disastrous fashion. Marcquise Reed hit two 3-pionters that cut the deficit to one, but Louisville survived. Elijah Thomas led the Tigers (15-10, 5-7) with 15 points. Reed had 13 points and 12 rebounds. ATLANTA (AP) — Christ Koumadje had 10 points and 12 rebounds as Florida State tied a school record with its seventh straight Atlantic Coast Conference win. Freshman Devin Vassell came off the bench to score a team-high 11 while playing in his hometown for the Seminoles (20-5, 8-4). Georgia Tech (11-15, 3-10) lost its seventh straight ACC game with another offensive struggle. Jose Alvarado led the Yellow Jackets with 17 points. ATHENS, Ga. (AP) — Tremont Waters scored 20 points, Ja’vonte Smart added 19 and LSU won its fourth straight game. The Tigers (21-4, 11-1 Southeastern Conference) are off to their best start in league play since the 1981 Final Four team was 11-0. They never trailed after Smart’s 3-pointer midway through the second half, but Georgia (10-15, 1-11) stayed close and didn’t allow LSU to lead by more than eight the rest of the way. MANHATTAN, Kan. (AP) — Lindell Wigginton hit five 3-pointers and scored 23 points, Talen Horton-Tucker buried six 3s and had 20, and Iowa State pulled away late to tighten up the Big 12 title race. Marial Shayok added 13 points and 13 rebounds for the Cyclones (19-6, 8-4), who pulled within a game of the Wildcats (19-6, 9-3) with six games to go in the conference schedule. Barry Brown had 23 points for the Wildcats, but he didn’t get a whole lot of help. The rest of the team was a combined 2 of 13 from the 3-point arc and 11 of 34 from the field. PISCATAWAY, N.J. (AP) — Joe Wieskamp banked in a 3-pointer from the corner with less than a second to play and Iowa posted a miraculous victory over Rutgers for its fourth straight win. After Iowa (20-5, 9-5) called a timeout, Connor McCaffrey threw a length of the court pass that Rutgers’ Eugene Omoruyi deflected. The ball went to Wieskamp in the corner next to the Hawkeyes‘ bench and his off-balance, high-arching shot hit off the backboard and went in the basket, setting off a wild celebration on the Iowa bench. PITTSBURGH (AP) — Kerry Blackshear Jr. scored a season-high 29 points, Ahmed Hill added 14 and Virginia Tech held off slumping Pittsburgh. The 6-foot-10, 250-pound Blackshear overwhelmed the undersized Panthers, making his first six field goal attempts on his way to a nearly flawless performance. The Hokies (20-5, 9-4 Atlantic Coast Conference) have won two straight following a two-game losing streak. Xavier Johnson led Pitt (12-14, 2-11) with 18 points.